Last week (or was it last month – yikes, what happened to April) I had some fun with a post featuring my top 10 super foods for men. My intention was to follow up with a top 10 super foods for women post, but I got behind and now I need to make a programming change. Women’s nutrition and more fun with the differences between males and females will air next week. Stay tuned because (gasp!) we really are different! Here’s why I’m interrupting my regularly scheduled program. I have a good reason. May is Celiac Awareness Month and Diane from The W.H.O.L.E. Gang has cooked up a blogging event called 30 Days to Easy Gluten-Free Living. You’ve probably heard people (even some top celiac docs) talk about the difficulties of life without gluten. And how awful it is. And woe is me. And blah, blah, blah. Like gluten was chocolate or something. Well, 30 different food bloggers are here to say otherwise. Check out this wonderful list of daily contributions. While there’s definitely a learning curve to living gluten-free and it’s not always easy, with knowledge and support, it can be the gateway to a whole new healthy and radiant lifestyle. Here we sit at the top of the food chain and many of us (gluten-free or not) have no idea what to eat. Factor in conflicting health advice and a diagnosis of gluten intolerance and suddenly eating becomes very complicated. It doesn’t have to be. In 2009 food guru Michael Pollan came out with a handbook of simple and straightforward food rules. Food Rules: An Eater’s Manual became an instant best seller. I’m going to borrow his easy-to-follow format and tweak it a bit to focus on gluten-free eating. Some of these “rules” are my own creations and some are adapted from Michael’s book. The point is to heal, renew, rev your engine, turn on your brights and thrive. But first, you need high grade, gluten-free fuel. Adopting these food rules will help you do that. Plus, you’ll lessen your chances of being zapped by gluten cooties. 1. Choose fresh, organic, whole foods. They’re gluten-free by default. No labels to read. 2. Make plant sources, especially vegetables, your foundation. 3. If it’s made in a plant, don’t eat it – if it is a plant, do eat it. 4. For the most part, choose foods you can hold in your hands and wash. Can you wash a box of Kraft mac and cheese, oreo cookies or a Hostess ding dong? You can wash cabbage, apples, tomatoes and you can rinse brown rice and quinoa. 5. If animals, insects and bacteria won’t eat it, we shouldn’t either. Food that has been sprayed with chemicals to repel critters isn’t a good choice for people either. 6. Don’t eat food that never spoils. If it doesn’t rot, it’s not food. 7. Stop eating when you’re no longer hungry, not when you’re full. No longer hungry is different from full. 8. Choose products (gluten-free flours, grains, etc.) that have been tested and are certified gluten-free. The Celiac Sprue Association (CSA) and the Gluten Intolerance Group (GIG) currently have certification programs. The National Foundation for Celiac Awareness (NFCA) is in the process of creating a similar certification program. 9. Ingredients are listed by weight on labels. Any product that has more sugar than other ingredients has too much sugar. Avoid HFCS (high fructose corn syrup). 10. If you can’t pronounce the ingredients, don’t eat them. 11. Avoid impostors (foods pretending to be something else). Think, “I can’t believe it’s not butter.” Eat real butter, not fake butter. 12. Eat a good portion of your veggies raw. Organic is best. Click here for a pocket version of the Environmental Working Group’s guide to organic produce (the dirty dozen and the clean 15). 13. Buy oils packaged in dark bottles and store away from heat. This prevents the oil from going rancid (very unhealthy). 14. Use the water you’ve steamed or cooked veggies in. Save it for smoothies or soups. It’s packed with good plant nutrients. 15. Pay more, eat less (see photo above). 16. “Eat breakfast like a king, lunch like a prince, dinner like a pauper.” I don’t know who originally said that, but it’s true. 17. Don’t eat food that has been tossed to you through your car window. Don’t eat and drive. 18. Prepare your own food, don’t get it from a vending machine or a gas station. 19. Eat all your meals at a table. 20. Be wary of supplement claims. If you want to increase your antioxidant amounts, eat beets, asparagus, blueberries, chard and cherries. Eat colorful fruits and veggies. Choose real food in its natural form. Don’t count on supplements unless you REALLY need them (verifiable deficiencies). 1. Preheat oven to 425 degrees. Place a piece of tin foil on a cookie sheet and lightly grease with olive oil. 2. Carefully rinse and pat dry the salmon filet (any size). Pour a little olive oil in your hands and rub it on the entire fish. 3. Place fish skin side down on the baking sheet and sprinkle with sea salt and freshly ground pepper. 4. Wash and trim asparagus. Pat dry and place in baking dish. Toss in a small amount of olive oil and place on prepared cookie sheet (see photo above) next to the salmon. Sprinkle with diced fresh garlic, sea salt and ground pepper. 5. 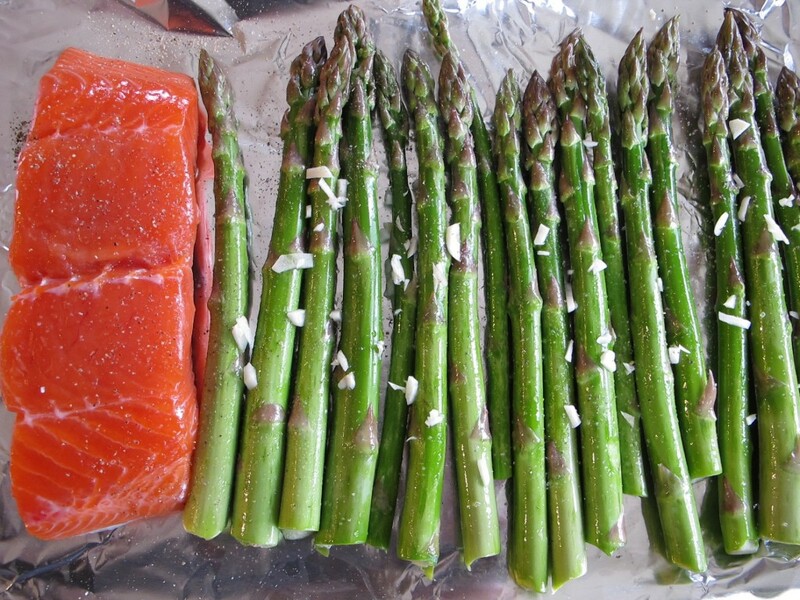 Bake fish and asparagus together in oven for 10 to 20 minutes depending on the thickness of the salmon. Remove when the fish flakes easily with a fork. 6. Serve with lemon slices and a fresh green salad. For more information on salmon, a detailed breakdown of EFAs (essential fatty acids – omega 3 and omega 6) and a tamari salmon recipe, check here. Peace, love and easy gluten-free living! This entry was posted on Friday, May 13th, 2011 at 3:48 am	and is filed under Celiac & Gluten Intolerance, Gluten-Free Recipes. You can follow any responses to this entry through the RSS 2.0 feed. You can leave a response, or trackback from your own site. Thank you for a wonderful list of pearls of wisdom! It’s not really for anyone gluten-free. It’s a good one for anyone who eats, period. I love these rules. #10 is still my favorite followed closely by #5. I think you should make these rules into a pocket guide! If you have an iPhone the EWG has an app for the dirty dozen. It also has the clean 15. This is great for me who has yet to memorize the lists. Thank you for sharing this as part of the 30 days! Thanks so much for creating and organizing this event. I’m thrilled to be part of it. I guess I should have asked everyone to mention their favorite “rule.” It’s fun to hear what resonates with each person. I just ordered an iPhone! Can’t wait to check out all the different apps! Great tips–thanks! I couldn’t agree more about sticking with whole, real foods, too. Thanks for your comment. I agree, whole foods is the way to go. It makes living GF so easy. No labels to read! I got so tired of reading labels when I found out I was intolerant that I just went straight for the fruits and veggies. This is a great post. Thanks for stopping by. I think a diagnosis of gluten intolerance is a blessing, for the response you suggest. It makes you head for the “low hanging fruit.” =) Why complicate things with labels?!! I love your rules! Simple and easy to understand. Melissa, you are always the voice of food wisdom and I LOVE you for it! These are all gems. I’m definitely printing them out and referencing them often. I think #7 is brilliant and #5 is one I’m always telling folks about and remind myself of when I have a few bits of my organic salad greens perish (rare with using them daily for green smoothies, but it does occasionally happen). #14 I need to improve upon. I definitely do it for my Everything soup, but have not saved this water for my green smoothies … I will now, thanks to you! I love your car analogy as the intro, too! Fantastic job, dear, but I expected no less from you. You’re always such a positive, knowledgeable and upbeat role model for people with gluten intolerance! And, I LOVE you for that. As for #7, you remember my post on the “Fuzz Speech” by Gil Hedley? I went to his in depth anatomy class at Kripalu in March? He said something to that effect while lecturing. I couldn’t remember exactly what it was, but it was about not stuffing yourself. Why do we do that?! Argh! We need to eat to enjoy the food and simply to satisfy our hunger, not to become overly full. Eating slower helps with that. Often, by the time it registers in your brain that you’re satisfied, you’ve over-eaten. Anyway, I agree, that is a good rule. It’s so obvious, but not something we tend to pay attention to. I love these Melissa! My favorites are number #4 and #14, it never even occurred to me to save the water I cook my veggies in, brilliant! Wonderful post as always, I learn so much from you and I really appreciate everything you do! Thanks! As for #14 — if I don’t want to mess with saving the cooking water, I use it to water my plants. I also have a salad spinner that gets daily use (a must-have kitchen tool) and I use the water from that for my plants. I have a HUGE cactus collection and it is thriving from my cooking water! Melissa, you are hilarious!! “And woe is me. And blah, blah, blah. Like gluten was chocolate or something.” Love it! And gluten cooties? Ha! What a wonderful list. I agree with ALL of them! Never thought of #14 though. I’ll give it a try! Love these rules – especially #10. Of course #7 is one I need to pay more attention to. Great post! Re: #19. I’d like to propose an addendum. Eat all your meals at a table, preferably with family or friends. Food is sustenance but food is also social (and, I think, healthier that way). Growing up, we always ate dinner as a family – no matter how crazy all our schedules, and no matter what time of night it meant that we ate, we always made sure everyone was at the table together. Great stuff from you, of which I’m not surprised! I totally agree about the joys of eating with family or friends. We’re lucky to have a close family to share our meals with, aren’t we?! Even though we have 4 kids, all involved in sports and activities, we always made an effort to sit down at the table and eat a home cooked meal. It’s so important for a variety of reasons! Thanks for the “addendum.” Much appreciated and right on! Cheers to you as well! You have no idea how much I love this list!! Seriously! You have done such a great job here. Everyone needs to follow your rules! Thanks for the food rules for thought and for your wonderful humor that always manages to brighten my day~! Two of my favorites, by the way, were #3 and #4! You’re such a sweet heart! Thanks for your kind comments! Yes, I’m a big fan of humor. Life would be a bit dramatic and difficult without a few smiles along the way. My #4 rule just seems to make sense to me (in a general way). It puts “real food” into an easy-to-understand category. Fantastic list! Now, if we could get everyone to follow it, can you imagine the health care costs we would save? Thanks for sharing this. Thanks for reminding us of so many great nutrition rules. I like #17 the best: “Don’t eat food that has been tossed to you through your car window. Don’t eat and drive.” I can’t think of one time I’ve gone through a drive through since going GF 4 years ago and I do not miss it. So many other great rules here too. Thanks! Isn’t it interesting how much more aware you are of your food choices when you’re forced to eliminate gluten? As I’ve said a zillion times, we’re the lucky ones! Being forced to adopt a gluten-free diet is a blessing. =) BTW, just plugged your wonderful kids book on Facebook. Great list — you describe these points so clearly! I’d like to do better at all this, but at least I’m doing better this year than the year before…a little bit each year adds up. Don’t be hard on yourself. It’s much better to make changes that last, even if it’s done in baby steps. We often do things too quickly — making lifestyle changes that stick is what is important. Good for you and keep up the good work, one step at a time! Love 19 and 20 especially! And love that these rules apply to everyone, not just people eating gluten-free! Thanks, Iris! You’re so right, it’s about eating well, whether you’re GF or not. I’d never thought of #14! You are a healthy genius Melissa. That simple salmon recipe is marvelous too. Salt and pepper goes such a long ways. Sometimes, I will cook it like that, but add fresh herbs. I also use water that I’ve rinsed my greens in to water my plants. It’s great natural fertilizer! Melissa – words to live by! This is a list I’ll come back to often just to remind myself how easy it is to be healthy and eat good, wholesome foods. Thanks, I appreciate your comment. The hard part is that this is very simple, just not always easy! Thank you for this great information. We just shared it in our Facebook page: http://www.facebook.com/LaptopLunches. Great gluten-free tips. Thank you for sharing this info! Hope you are having a great weekend. So happy to have come across your gluten-free blog and thrilled to see your future posts! Thanks Healthy Apple! Happy to run across your blog as well. Great stuff! Hi Food Fairies! Thanks for the comment. Great thoughts on gluten intolerance. I appreciate your input! Nice post , i’m trying to avoid gluten as much as possible and this article made it easier.